Golfers are always looking for an edge to improve. We generally take lessons to improve our golf swing and also look toward equipment for distance, accuracy, and forgiveness on our not-so-great shots. But another area has arisen in recent years that will help – golf specific fitness training. There has been considerable debate recently about strength training and its place in golf even here on The Sand Trap. Tweets from golf analysts have sparked the debate on how much should be done and whether it is a help or hindrance. Pros like Gary Player have long advocated fitness as an important part of becoming a better golfer. The current crop of young PGA stars, including five-time LPGA winner Anna Nordqvist and 2016 Puerto Rico Open Champ Tony Finau, our Golf Strong Video demonstrators, also have fitness training as part of their routine. Companies like Titleist have created golf specific exercise systems that can be viewed online. The Titleist Performance Institute created MyTPI, which was reviewed here on The Sand Trap. There have also been books on golf fitness that have been reviewed here by our staff or in member reviews. Personal Trainers to golf professionals have also created programs. The evolution of these programs has come from understanding the physical requirements of the golf swing and developing programs specific to increase strength and flexibility. It should be no surprise that, with this kind of training, current professional golfers can hit the ball a long way. 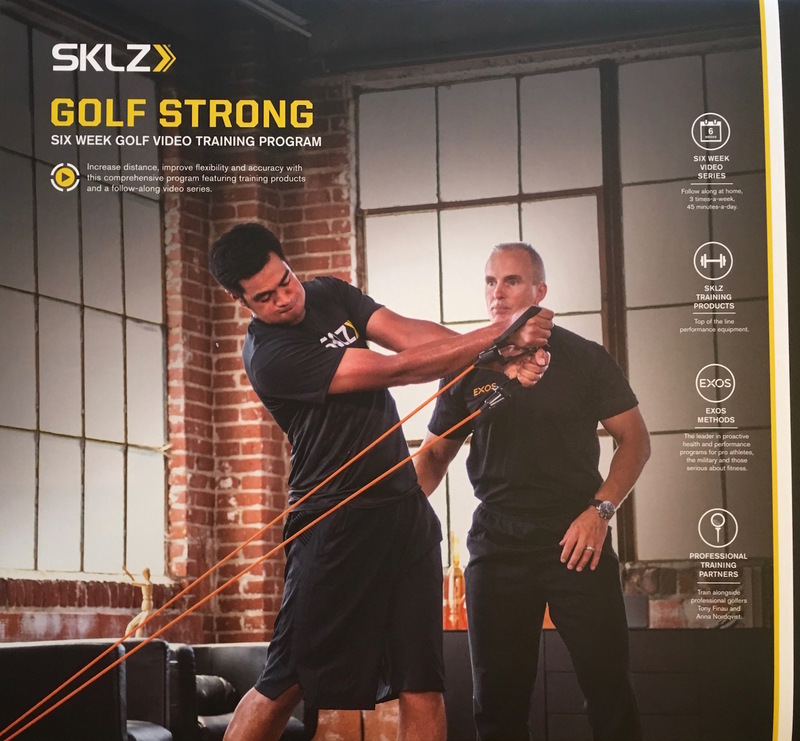 SKLZ, which sells sports training devices, has created a golf-specific training program called Golf Strong. SKLZ started out with baseball-specific training equipment in 2002 and has expanded to basketball, soccer, football, and now golf. They specialize in training devices that are portable and can be used at home, gym, or on the road. To design a golf-specific program, first you must understand the stresses the golf swing puts on the body, then create exercises to stabilize and strengthen those areas. For this, SKLZ turned to EXOS, a leader in integrated performance training, nutrition and physical therapy and EXOS founder Mark Verstegen. EXOS began in 1999 and was geared toward elite athletes, but has now expanded toward the general public. Add distance to your game and improve your flexibility to reduce common aches and pains. Train at home for just 90 minutes per week and follow along with professional golfers Tony Finau and Anna Nordqvist. The kit includes everything you need to improve your body for better golf. Helps build the strength and flexibility needed to increase club head speed and add measurable distance and accuracy. Improves your swing performance while helping to reduce the common aches and pains associated with golf. Get real, course-proven results at home in just 90 minutes each week. Train at home and follow along with professional golfers Tony Finau and Anna Nordqvist. Includes 2 DVDs, 2 Mini Bands (Red/Yellow), 3 Training Cables, 2 sets of Flex Handles, 1 Door Anchor, Slidez, and 1 AccuPoint. In addition to DVDs, videos are available online after purchase. You can then view the videos on your smartphone or iPad. What’s in the box? Cables, Flex Handles, Slidez, Mini Bands, AccuPoint, and DVDs. The emphasis of the SKLZ Golf Strong Video training is on core strength, stability, and flexibility. These form the basis of a good golf swing. You need a stable core for a proper back and downswing, flexibility to make a good hip and shoulder turn, and strength for a fast downswing. Improving in these areas can increase swing speed, but equally important, improve stamina so you are as strong at the finish of a round as you are in the beginning. The program is broken up into two phases; a developmental phase, where you learn the movements, and a performance phase that uses more complex movements specific to building distance and flexibility. Each phase is three weeks and subdivided into three workouts per week: distance, accuracy, and flexibility. The distance and accuracy days are strenuous workouts. The flexibility day is less strenuous but equally important. Anna Nordqvist demonstrating single leg squats using a slide. Each training session has three parts: a warm-up and two separate circuits of exercises that you repeat three times. The warm-up phase has active stretching to loosen muscles and uses the resistance bands to prepare you for the circuits. Like other fitness programs, the exercise circuit rotates between muscle groups to reduce fatigue on any one group, but keeps you moving which keeps your heart rate up. The first time through a circuit, you get used to the movements, some of which require a lot of balance. By the third time through the circuit, you’ve got it down. The sessions end with flexibility work using both stretching and the AccuPoint dual point massage device. In total, the workouts are 30 to 45 minutes. Both the distance and accuracy training days have similar exercises that work the core, legs, hips and shoulders. The primary difference is that the distance day works the body for strength and rotational speed and even has plyometric components (jump-type work). Accuracy days are geared a bit more toward core stability and balance. Tony Finau uses Slidez with a plank. Mark Verstegen does an excellent job coaching you through the workouts. He is not one of those super enthusiastic, over-the-top trainers you get on some workout videos. You know the kind where you would guess they had seventeen espressos just before filming. Mark keeps your focus on posture and gives keys to what you should be feeling. The workouts are strenuous even though they are not high impact. I worked up a good sweat in the development phase and even more so in the performance phase. Graeme Lauriston has a physical therapy background and does an equally good job coaching you through the flexibility sessions. Again, the focus is on proper movements. I have completed the six week Golf Strong video series. I’ve done a couple of other programs previously and was in a routine on my workouts that incorporated parts of each. This included my physical therapy exercises that I do religiously. I am already seeing results with Golf Strong that differ from the other programs. I feel less fatigued at the end of a round or range session and stronger in the core. Tony Finau using the training cables. The core focus is a bit different than I have done before even though I did core exercises. The emphasis on keeping your core in the proper position while doing leg and shoulder work really makes a difference. Mark will remind you to “get into your 5-iron stance” at the start of the exercise. This is a great visual because it puts you in golf swing mode while doing the exercise. You really feel how the exercise affects the golf swing muscles when you do it correctly. I’m not sure if I am getting more distance. That is hard to tell with the weather changing all the time. But I am feeling improvement in my core and less tired at the end of the day. After the first week of Phase 2, I also did not feel sore the next day, which is a bonus. As you get older, soreness can linger more than when you were young, especially after doing new exercises. The training devices are quality made. The Flex handles allow you to quickly change cables. My set came with red (medium), purple (medium light) and yellow (light) training cables. For some exercises, I could have used more resistance. You can purchase additional cables on the SKLZ site for between $8.99 and $16.99 for light to extra heavy cables. Equipment included in Golf Strong. The Slidez allow you to do smooth movements with arms or legs. The Slidez worked equally well on a carpet or wood floor. There are additional instructions on use of the Slidez included with the set. The Slidez came in a small pouch, which seemed unnecessary. I would have preferred the whole kit to come with a bag to put everything in. I ended up using an inexpensive, drawstring book bag from my son’s college to store the gear. The AccuPoint is a dual point massager shaped like a peanut. This evil, wonderful device aids in stretching tight muscles and tendons, removing knots and relaxing muscles. If you have ever used a foam roller, you have an idea what it does. At first, it hurts. But if you breathe in and out like Mark and Graeme suggest, the pain fades and the muscles relax improving flexibility. At first, I wasn’t sure if the AccuPoint was doing anything other than torturing me. But after a couple of weeks, I really noticed a difference and it doesn’t hurt anymore. The advantage the AccuPoint has over a foam roller is it can target smaller areas in the calf, thighs, IT band, back, glutes etc. than the roller. The peanut shape fits perfectly on either side of the spine and will loosen both side of those tight muscles that only a massage could do before. It works the same with the calf giving equal opportunity to both sides. It is small and can travel with you to the gym or even during business or holiday trips. I am going to pick up another AccuPoint and heavier cables from the SKLZ site. One AccuPoint will stay at the gym and the other will be at home or with me when I travel. Find a good place for doing this program. You need at least a 10 x 10 space and a good door to anchor. Another option would be at your gym. You can anchor the training bands on anything. I’ve used a weight machine’s clips, an exercise cycle’s handle bars and base, etc. Review the videos before you do a session for the first time. This will give you and idea of the exercises and how to set up your workout area. Keep the pause button handy! Getting into those Mini Bands takes practice. Also, some of the more complex movements may take a few seconds to set up. The workout moves along fast, so the pause button is your friend. Start off with lighter training cables. It may seem easy the first time around, but it adds up. I have considerable experience with physical therapy exercises (unfortunately!). It is much more productive to use the proper movement with lighter weight or resistance, than to load it up. SKLZ Golf Strong video series is an excellent program to build core strength and flexibility for the golf swing. The videos are well made, the program is easy to use and you can do it at home, while traveling or at a gym. I am pleased with the way the program works and its portability. There are some things I would add to improve the series. First, there is nothing in the videos or the program literature about what to do after you complete the six week program. There really should be a maintenance phase or instruction on how to keep the fitness and flexibility you’ve gained by completing the program. For me, I will just keep doing Phase 2 elements in my weekly work. When I have time, I will do the videos again. Otherwise, I will incorporate some of the exercises and AccuPoint work into other workouts. Second, if SKLZ and EXOS come up with more ideas to supplement the series, they should add it to the Golf Strong video location. This would keep customers coming back to the site. It would also keep the workouts fresh, which can be a challenge. From an equipment standpoint, the door anchor could be improved. If your door doesn’t have tight gaps, the anchor can slip out. My spare bedroom has a cheap door that in winter shrinks and makes the gaps too big. An anchor with a larger fabric knot and more length would allow me to secure it even on doors with larger gaps. For the review, I did most of the work at my gym. A small carabiner would be a great addition to the kit that would give you another way to secure the cables. Lastly, instead of a bag for the Slidez, a Golf Strong drawstring bag with a logo on it would be a better addition. All the gear could fit into it and it would advertise the product. Excellent review. I also have the golfstrong program, and it wore me out when I first started – 45 minutes of hard wor, and then sore the next day. Doesn’t seem like you’re working hard and then you realize that you’re putting out a sweat. Sometimes, I break up the workout into 25 minute session as a work break. Best program I’ve seen for golf.